Join us on Sunday, 7th April, at 4pm for our next instalment of 4 o’clock church! 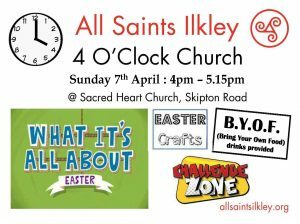 This Sunday will have an Easter theme with Easter crafts, a time of worship and a talk on ‘What it’s all about’. All are welcome to join us! Just head to Sacred Heart Church!